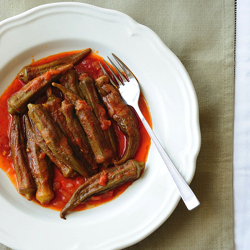 Quail are popular game birds in Greek cooking, and this delightful recipe combines favorite tastes of tomatoes, onion, garlic, parsley, and baby okra. 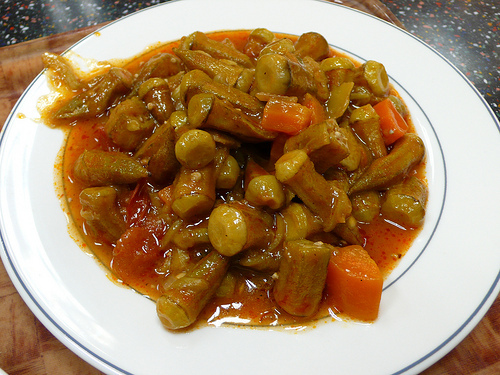 This recipe is particularly pretty when served due, in large part, to the size of the baby okra and boiler onions. No quail available? 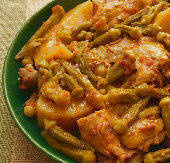 Try this recipe with game hens and adjust cooking time. Rinse quail and season with salt and pepper to taste. Heat 3 tablespoons of olive oil in a stew pot or dutch oven and brown the quail on all sides. Add the onions (whole), garlic, and tomatoes. Slow boil, uncovered, for 10 minutes. 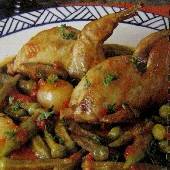 In a skillet, fry the okra in remaining olive oil until softened, and add to the pot with the quail. Stir in parsley, vinegar, water, and more salt and pepper to taste. When boil resumes, simmer uncovered for 20 minutes longer, or until quail are done.